What is cheaper than a billboard to show your wares? The side of a building. This is 8th Avenue and 46th street early in March of 2014. I was standing on the south west corner when I saw this. What was on this corner, I am already not recalling, which is kind of scary. Or does it mean that I have taken things for granted for too long? 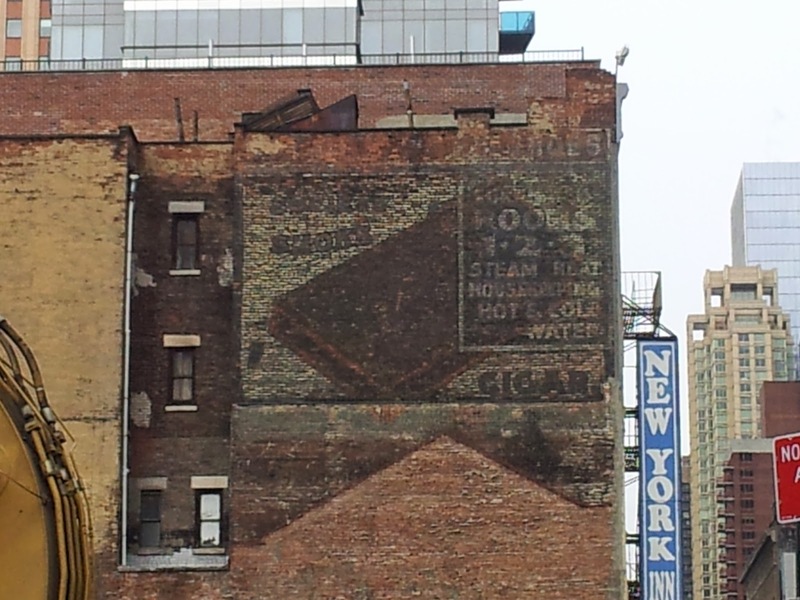 There are 2 ads here; one is for a cigar and the other is for a hotel of some kind. The hotel or rooming house offers the conveniences of steam heat, hot and cold water and housekeeping. Is this hotel the building to which the sign is applied or is it elsewhere? I will venture that advertised digs is now called the New York Inn. As for the cigar, I could not make it out when I was there or even now. 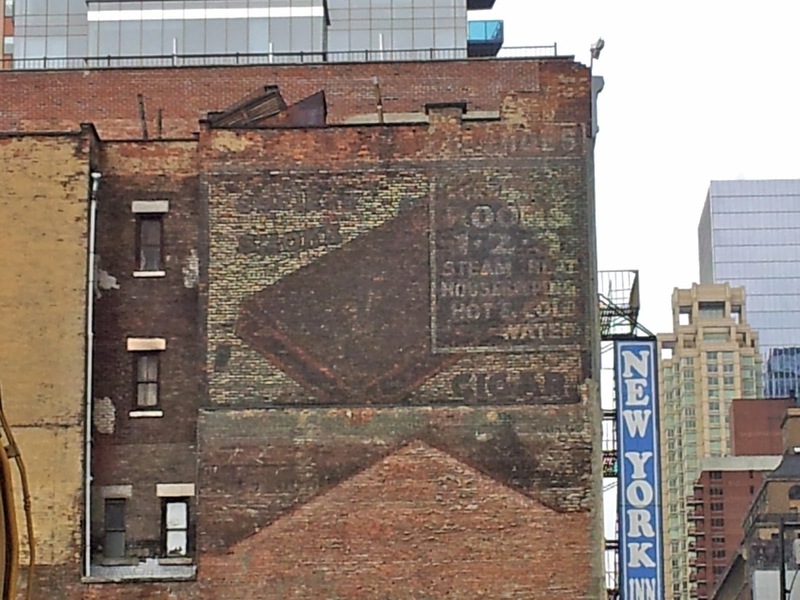 What is also very cool is the mark, almost a tan line, of the structure that was on the south side of the now New York Inn. Sometimes a demolition peels back a layer as I do not recall seeing the sign on the building, or the tan line, prior to the demise of the tenement on the corner and the small building in between. The small building in between having been torn down first has left it's mark, a reminder that it was there. For how long we will be reminded? 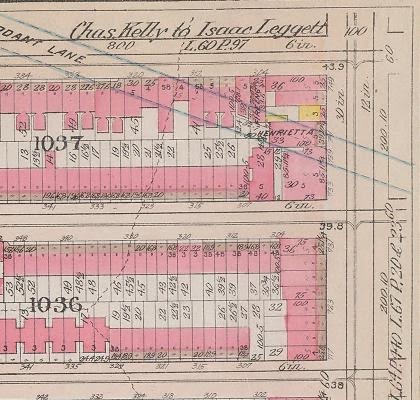 This is from the map of 1911. The Henrietta was the tenement that has been demolished and the little yellow structure is the wooden building that left it's mark. The Lane that is coming through the Henrietta is Verdant Lane and it runs all the way from the river between 49th and 50th streets. It takes a turn along the way to bring it down to 47th street. More on that lane later. This is an enhanced version of the first picture. Enhanced but I still can't make out the name. Better get there soon as something, I am sure a fine visual addition to an avenue trying to reinvent itself, will forever block this view.